321 S.S. (other alloys available upon request) flexible metal hose lined with smooth PTFE liner and flared thru standard end fittings. Designed for applications requiring a large diameter smooth bore flexible hose combining the unexcelled corrosion resistance and sanitary properties of PTFE and the durability of flexible metal hose. This smooth bore hose is specified and used in an endless variety of applications where the conditions of service are beyond the capabilities of rubber, synthetic or metal hose alone. The PTFE smooth bore I.D.’s minimize pressure drop. MTH is available with virgin PTFE liner. Corrosion Resistant - PTFE is fully resistant to the broadest range of industrial chemicals and has a zero corrosion rate, lower life cycle costs and is non-contaminating. Cleanable - Non-Stick, low porosity tube does not trap bacteria, and can be readily cleaned with steam, detergents, caustics or solvents. Sanitary – FDA approved materials meet or exceed 3A requirements. Durable - Designed for extended use in hostile environments involving severe chemical, thermal and mechanical stresses. Does not suffer aging or embrittlement, even with extreme thermal cycling. Double containment - Metal housing is a secondary containment vessel. The thick PTFE tube passes through the end fitting and is flared radially outward against the sealing face of the fitting. 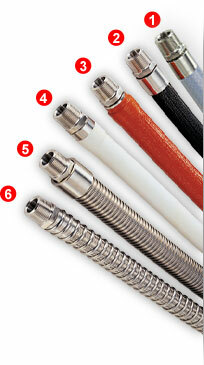 This economical design creates a continuous PTFE fluid conduit. Standard fitting style available is Flanged. Flange materials available in Epoxy coated Carbon Steel, 304 S.S. and 316 S.S. Minimum allowable temperature applicable only to stainless steel flanged assemblies; carbon steel flanged assemblies are limited to -20°F.